Where a lot of companies are pushing the specs and the prices of smartphones ever higher, phone network operators Vodafone have zoned in on the other end of the spectrum and created their cheapest handsets to date. The Vodafone 150 and 250 are aimed at consumers in India, Africa and Turkey and will retail for 15 US dollars (£9.50) and 20 US dollars (£12.75) respectively. The Vodafone 150 and Vodafone 250 both offer “excellent” voice and SMS services, as well as support for mobile payment services. 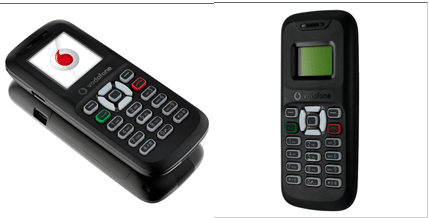 The two devices share most specification features, the main differences between them being that the Vodafone 250’s screen is both colour and slightly larger, and it has an FM radio. The inclusion of mobile payment services is a big deal – Vodafone says that more than 11 million registered customers across Vodafone’s footprint now rely on their mobile phones for money transfers and bill payments.